Heat oven to 375°F. Grease bottom and sides of 8-or 9-inch square pan. In medium bowl, stir softened butter and egg. Stir in cookie mix (dough will be stiff). Reserve 1/2 cup dough for topping. Press remaining dough into pan. Bake 15 to 20 minutes or until light golden brown. Meanwhile, in medium bowl, microwave caramels and milk uncovered on High 2 to 3 minutes or until cramels are completely melted, stirring every minute. Spread caramel mixture evenly over crust. 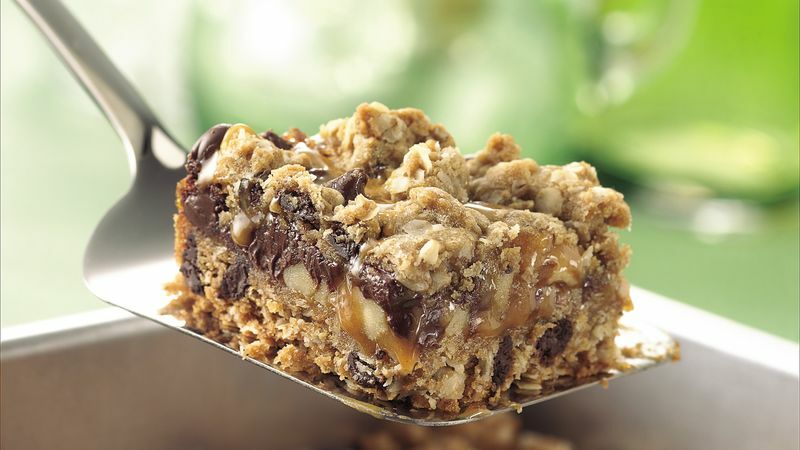 Drop reserved cookie dough by teaspoonfuls over caramel mixture. Bake an additional 15 to 20 minutes or until golden brown. Cool 10 minutes. Run knife around edges of pan. Cool completely before cutting.